A country perceived as having unusually complex political, economic, and social problems, Peru has long fascinated social scientists. The Peruvian Labyrinth brings together a new generation of scholars to explore the multifaceted Peruvian "experiment" as it has evolved further, in often dramatic ways, in the 1980s and 1990s. The volume focuses special attention on the administration of Alberto Fujimori, who suspended the constitution in 1992, two years after he first became president, but then was reelected in 1995. The experience of Peru under his regime raises important questions about the nature of democracy in Latin America, the challenges of economic and political reform, and the prospects for combining stable democratic governance and sustained development. "The Peruvian Labyrinth should be required reading for all who wish to understand the myriad complexities of the contemporary politics of Peru." 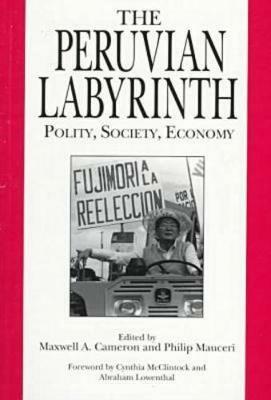 "An authoritative, well-written, and up-to-date account of the 1970s to 1990s in Peru, The Peruvian Labyrinth concentrates on the Fujimori regime and its achievements, particularly in its search for economic stability and sustained development. It is objective, and also critical of the regime in some respects, questioning it in terms of the way democracy is viewed and applied." "If you seek to navigate through the complex, often confusing terrain of contemporary Peruvian politics, The Peruvian Labyrinth is an essential guidebook. The volume's essays, grounded in solid empirical research, are full of analytical insights that will be of interest not only to students of Peruvian politics but also to theorists of state-society relations, institution building, and democratization." "The Peruvian Labyrinth uses a well-chosen variety of angles to explain the complicated factors that made Peru stand out as one of the most troubled countries in Latin America in the 1970s and 1980s, and have shaped its partial recovery in the 1990s. They capture a great deal of the devastating process in which particular problems reacted on and aggravated each other to worsen violence, economic deterioration, and political decay. They also bring out well the mixture of gains and losses in the 1990s, as the Fujimori government managed to restore a sense of order and governability but also weakened democratic institutions, the violence of Sendero Luminoso was checked but governmental abuses of human rights took ominous new turns, and the economy recovered but in perhaps even more unequal ways than in the past. The individual chapters are all clearly written, raise important questions, and convey a realistic picture of an exceedingly complex process." "The Peruvian Labyrinth comprises the most up-to-date and thorough examination of Peru available today in English, and perhaps in any language. It offers the newcomer a challenging introduction and the expert much to work with. The chapters are of uniformly high quality and reflect much care on the part of the editors. Altogether an excellent piece of work."